Adware.BuzzSocialPoints can be installed onto Internet Explorer, Mozilla Firefox and Google Chrome web browsers. We categorize the application downloadable from buzzsocialpoints.com as adware because it can expose you to advertisement-supported search results. As our researchers have revealed, the plugin has not been available from its official page for quite some time now (since early 2013); however, you may acquire it bundled with freeware. Do you know why this is dangerous? If you have no idea where the application came from, you may be completely oblivious to tens of dangerous computer infections on the PC. Keyloggers and worms do not have interfaces; however, they are much more devious. Needless to say, we recommend that you delete Adware.BuzzSocialPoints from the computer. Even though Adware.BuzzSocialPoints promises you to enhance browsing experiences and earn money while you are at it, our researchers have revealed that you may risk your virtual security by interacting with the presented adverts. Do you want to become a victim of virtual scams, Trojans and other malign programs which may be dropped onto the computer if you are not careful enough? If you have installed BuzzSocialPoints onto the computer it does not automatically mean that you will need to worry about surreptitious malware installation. Despite this, you should delete Adware.BuzzSocialPoints right away. Do you know how to delete Adware.BuzzSocialPoints from the operating Windows system? We have prepared the manual removal instructions which will help you achieve this successfully. However, even if the plugin gets removed, there is a chance that suspicious cookies will continue spying on your virtual activity. Therefore, you should install automatic malware detection and removal software to make sure that all security threats are eliminated and the system is protected in the future. Open the Start menu (on Task Bar), click Control Panel and select Add or Remove Programs. Click Start to open the menu, select Control Panel and click Uninstall a program. Right-click on the Metro UI start screen, select All apps and click Control Panel. Go to Uninstall a program, select the undesirable application and click Uninstall. 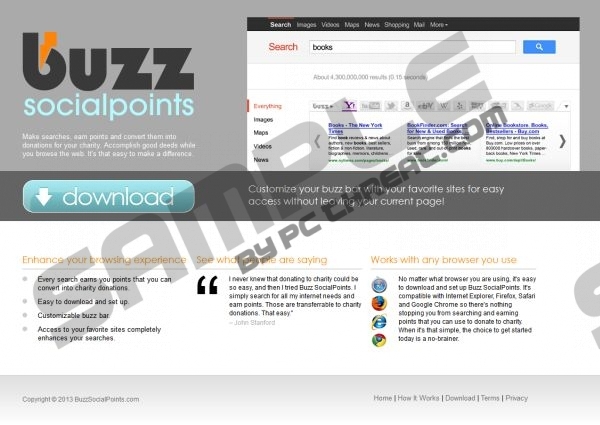 Quick & tested solution for Adware.BuzzSocialPoints removal.